*Prices based on double occupancy, sharing a room. Additional supplement charged for anyone in a single room. This tour is on paved roads throughout. Any unpaved surfaces will be optional excursions. This is a superb romantic event for couples and intensely flavored with biblical history and ancient archeology. Turkey, contrary to commonly held perception, is very safe and a favorite MotoDiscovery destination for over a decade. If you Don't Experience Turkey, you are Simply Missing Out! The ancient City of Istanbul, once known as Constantinople, where the straits of the Bosphorus and Sea of Marmara merge. Sultanahmet inside the old walled city is where you will find the Blue Mosque (1616 A.D.) and the architectural wonder of the Hagia Sofia (537 A.D.), the Ottoman Topkapi Palace, Underground Cistern and more. Cappadocia is an arid sprawl of soft volcanic stone pinnacles with carved habitats, including your hotel. You will want to take advantage of a breathtaking hot air balloon ride here. A tour will be organized to the underground city of Derinkuyu that could inhabit as many as 25,000 people. The story of these subterranean dwellings is as fascinating as the construction itself. The moving WW I battlefield monument of the Gallipoli along the coast of Dardanelles, so much a part of New Zealand and Australia (ANZAC) history. The biblical city of Ephesus dating back to 500 B.C. The waters of the Mediterranean and the hip seaside city of Bodrum with its 15th-century castle. There is also a fascinating museum dedicated to the ancient mariners at this crossroads where Asia meets Europe. The service is the best. Each day will be a history lesson, your escorts not only motorcyclists but authorized and highly educated licensed tour guides. The city of Konya best known as a pilgrimage destination and final resting place of Rumi, the great 13th century Persian Sufi poet, theologian, and Wiseman. Glad you asked. To be fair, at MotoDiscovery we say that we have not been to our favorite country yet….but Turkey is definitely number two! With over 15 years of riding this part of the world, we regard The Turkey Fantasy as some of the most rewarding and exciting motorcycle travel that we offer. You can’t keep us away and our riding friends come back year after year for good reason. The place is magic! This tour is scheduled to be on paved roads throughout although there could be some opportunities to do some exploring off road. We refer to this as a Road Tour. Definitely! In fact, the ladies universally love Turkey and if you are like most whom we’ve hosted there, this will not be your last tour to this fascinating land. Our late model fleet is expertly maintained by the dealership in Istanbul. The selection of BMW 700/800 and 1200 GS models satisfy all demands. They come with a sizable tail luggage that serves well for passengers as a backrest for your pillion rider. Please, bring along your personal GPS and mount. Do you provide GPS waypoints? Yes. We encourage the use of GPS. Please bring your personal GPS and mount. This is often asked. Without hesitation, we say YES! It is safe. Millions of tourists visit Turkey each year from around the world. Istanbul was voted Europe’s Cultural Capital in 2010. It is a moderate secular nation and enjoys a thriving economy. And if we are reminded one more time of the 1970’s film, Midnight Express we are going to choke! Turkey is so profoundly rich in history, culture, and tradition that one simply can not go there without the benefit of knowledgeable tour staff. We have the best in our friend Kazim Uzunoglu and his team. In Turkey in order to be a tour guide one must be highly educated in the layers of Turkish history that stretch across the millennium. We’ve enjoyed over a decade of travels with Kaz. Our relationship is unique. This is not a “hand-off”. He is one of us and you will find that when it comes to Turkey, no one rivals MotoDiscovery...period. Does the tour have a support vehicle? Yes. We carry your luggage and accommodate roadside emergencies. And with advance notice and room permitting we are pleased to have non-riding participants join us. At MotoDiscovery we think dining should be more than just consuming calories..it should be a celebration. The cuisine of Turkey is some of the finest you will find anywhere in the world. Turks are fastidious about freshness. Tables fill with mezes - small dishes of fresh preparations of cheeses, yogurt, olives, seafood, eggplant, beans and salads, fusions of Mediterranean and Asian flavors complemented by fresh breads. Then the main courses of fish, lamb, beef or chicken arrive! To drink you will, of course, have great wines and to be completely absorbed one must try Raki, the national beverage. When it comes to dining, count on a truly exciting 'foodie' experience. What do we do other than ride? There are more Roman ruins in Turkey than in Italy. There are more Greek ruins in Turkey than Greece. And that is just the start. The place has biblical connections and one can hardly go anywhere without coming upon incredible archeology. So, along the way, you will learn about the great history of this magical place. Istanbul alone will keep you spellbound so plan on arriving a few days early. We will stay at everything from converted centuries old caravanserai along the Silk Road to modern and contemporary hotels and resorts. We prefer to keep it quaint and authentic when we can. You will find our accommodations to be excellent. Do you book our air? Sorry, that is just too complex. You will have to secure your own flight arrangements. There are daily nonstop flights from the USA to Istanbul on all major carriers. 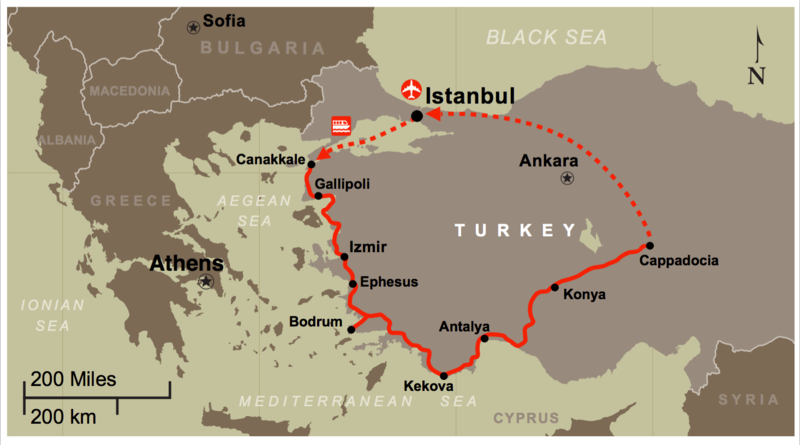 We do however book and include your domestic flight from Cappadocia to Istanbul at the tour's end. Call us for consultation. Now. These tours often sell out. Even more painful is when we are forced to cancel the date because we are a few riders short only to have people try to get on last minute. Book early. Tell your friends. If you are interested in a private tour of Turkey with you and your friends, we do that too. Please fill our Custom Tour Form and we will get to work on your personalized adventure.